﻿Believed to have been written in 1599, Julius Caesar is one of several of Shakespeare’s plays based on events of Roman history. Its enduring themes dealing with power, loyalty and friendship, as well as the twin questions of what constitutes “good government” and how to achieve its orderly transfer, have resonated with audiences down the centuries. The closing years of the sixteenth century were underlined with anxiety about the inheritance of the English throne, as the aged and unmarried Queen Elizabeth I refused to name an heir, and the memories of earlier bloody wars of succession were still fresh. The performance history of Julius Caesar has tended to respond to current political events, rising and falling in popularity as it reflects events of the day. For example, interest in the production in England dropped off in the late eighteenth century just as it was finding favor in American colonial theaters. It has been reinterpreted by several generations of theater luminaries, including a contemporary staging created by Orson Welles in 1937 that, at 157 performances, became the play’s most popular single production. Shakespeare based Julius Caesar, as well as Coriolanus and Antony and Cleopatra on Plutarch’s First Century accounts of the lives of famous Greeks and Romans. The source material had been published and translated on the Continent and in England from the 1400s, and the classical history was well known to the audience of Shakespeare’s day. Interestingly, Shakespeare does not offer a clear-cut and definitive villain in Julius Caesar. It’s possible that because his country’s current political situation was so precarious and Shakespeare may have been using Julius Caesar as a vehicle for commentary on that situation, that it was prudent not to put forth an obvious hero. Elizabethan England was not an era for outright criticism of the powers that be, even for a most loved poet and playwright. Scholars will argue (of course) who fills the roles of protagonist and antagonist / heroes and villains in Julius Caesar. Brutus – The brave general who stood by Caesar’s side but who’s love for Rome is so great that he allows himself to be convinced that Caesar has become a threat to his country’s very existence? Julius Caesar – The conquering hero who has brought fortune and glory to Rome? A brilliant man riding high on staggering accomplishments. Mark Antony – Steadfast champion of Julius Caesar who wants the best for all Roman citizens and believes that Caesar embodies those best qualities? Cassius – Triumphant general who fought as long and hard as Caesar but saw through what he deemed his façade and vehemently questioned Caesar’s elevation to near godlike status? Although he commits the ultimate act of personal betrayal to help assassinate Caesar, Brutus is often seen as the play’s tragic hero. 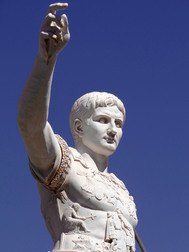 People in the Mark Antony court point out the supreme virtue of his steadfast devotion to Caesar, his appeal to the common man and his ultimate victory at war. That makes him the hero, right? Arguments can be made for the other main characters – perhaps slightly less so for Cassius – but ultimately, Shakespeare leaves it to you to decide. Beware though, once you do, it’s hard to change your mind. The characters in Julius Caesar are so charismatic and passionate that Shakespeare makes it easy to fervently devote yourself and defend your of choice of hero and villain. Co-directors M.L. Cogar and Tom Reed are, respectively, Shakespeare in the Park’s Dramaturg and Associate Artistic Director. Cogar most recently directed the company’s 2014 presentation of The Winter’s Tale. Reed directed As You Like It in 2013 and has performed in several of SitP’s productions, including as Puck in 2015’s A Midsummer Night’s Dream.